St. John’s Adult Choir is a great opportunity to make music! We sing for worship several times per month and enjoy rehearsing together on Wednesday evenings. New members are always welcome. Check out the Fall 2016 Choir Schedule for full details! Frequently Asked Questions — with answers! Q: Do I have to be a member of St. John congregation to sing in the choir? A: No! The gathered church is a group of sinners in need of grace, not a country club of the elite saved. More singing sinners are always welcome! Q: Do you sing traditional music? Do you sing contemporary music? A: Yes. And no. And both. And neither. The choir enjoys singing music from a wide variety of musical genres. We may sing a modern hymn, chant a Psalm, and sing a newly written hymn stanza in the same service—all of which focus on God’s redeeming and restoring work for us. Q: What does the choir do? A: The choir’s main focus is encouraging the congregation’s song—they’re actually the most important choir! Our “smaller choir” of 40-50 introduces new music to the congregation, sings portions of Scripture within the liturgy, and sings stand-alone pieces during the offering and communion. 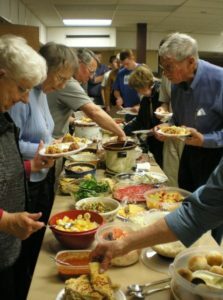 We also have amazing potlucks and, in general, a great time! A: The music room at St. John — which is classroom 108, located on the main level just down from the sanctuary. Have another question? Ask Cantor Soulek!